The Florida Bar News has an article titled "E-filing Open for Business." 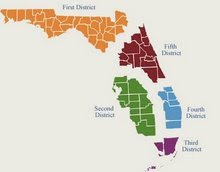 You can register to be an e-filer at THIS site and after you register you can e-file at THIS site in the following counties: Columbia, Duval, Gulf, Holmes, Lake, Miami-Dade, Putnam,Walton. Every county is expected to be using e-filing soon. Note that you are required to also file the original signed document for the first ninety days. I am not certain if it is ninety days after the e-filing portal opened on January 1, 2011 or ninety days after the specific county you are filing in begins accepting e-filing. The Florida Bar News had an article dated January 1, 2011, titled "Phasing in E-filing."